Sindh Assembly speaker Nisar Ahmed Khuhro presided over the session, which began after an hour delay. A total of 155 members were sworn in, who later signed official documents for record. The oath, administered by Khuhro, was taken in Urdu, English and Sindhi language as per each member’s preference. 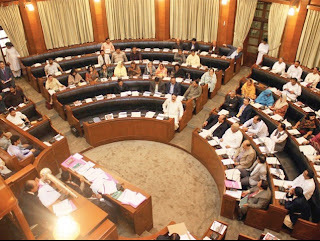 Out of the total 168 seats in the provincial assembly, 130 seats are allocated for those who come through the general election, while 29 are reserved for women and nine for minorities. According to the notification issued by the election commission, Pakistan Peoples Party (PPP) has received around 67 seats, followed by the Muttahida Qaumi Movement(MQM) with its 37 seats. The third in line is the Pakistan Muslim League-Functional with seven seats, followed by Pakistan Muslim League-Nawaz(PMLN) with four seats, National Peoples Party with two, Thatta’s Shirazi group with four, Pakistan Tehreek-e-Insaf(PTI) with three and one seat by an independent candidate, Syed Abdul Nabi Shah.